As mentioned in last night's posts both here and on my Read Books blog, I was given two (2) copies of this book. One for my own reading and reviewing pleasure and one to give to anyone I want. So I have decided to read this book, review it, and give it away to one of my *cough* faithful readers. So, suffer through yet another boring book review and you will find out how to maximize your chances of winning this great book. Or, skip my review and scroll down to the final section entitled "Get it Free" to, you know, get the book for free. This book is 207 pages long, divided into eleven (11) chapters with an introduction and notes. It was an easy, two-day read. I give this book 3 out of 5 stars for technical merit. The book is great, it delves into some fantastic principles and applications that are needed in the church today. However, some of the syntax is a bit wonky. In addition, I found a few typos in the text. I understand this is as much a critique of the editor as the author, but this is a review of the book and that comes into play. However, in the midst of the mundane, Michael Kelley does come through with several memorable moments. He is very good at laying a foundation and them summarizing his points with a poignant phrase. If you get stuck on one paragraph, keep reading with the confidence that he will rephrase his point, perhaps in a way that resonates with you. I know it did with me. 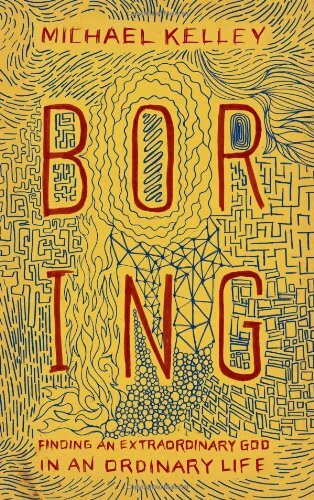 All too often, we seek to escape our boring lives. Often, it is when we seek to escape boredom that we end up in trouble. God placed us in this life for a reason. We are to glorify Him in all things. We are living in His redeemed creation. We have renewed purpose. We are children of the kingdom and should seize every opportunity that life affords us! This is a nice little book that I heartily recommend to all my Christian friends. Michael Kelley is theologically sound and gives great practical advice. I will probably refer to these individual chapters for topical studies in the upcoming weeks. What does this mean for you? More chances to win a free copy!